Gets the Gtk::Settings object for the default GDK screen, creating it if necessary. A Gtk::Settings object. If there is no default screen, then returns nullptr. Gets the Gtk::Settings object for screen, creating it if necessary. Holds a hash table representation of the Gtk::Settings::property_gtk_color_scheme() setting, mapping color names to Gdk::Colors. Deprecated: 3.8: Will always return an empty hash table. Will always return an empty hash table. Whether buttons in dialogs should use the alternative button order. By default an arrow pointing down means the column is sorted in ascending order. When set to true, this order will be inverted. If a GTK+ theme includes a dark variant, it will be used instead of the configured theme. Whether images should be shown on buttons. Deprecated: 3.10: This setting is ignored. Deprecated: 3.10: Only used by the deprecated color selector widget. Only used by the deprecated color selector widget. Default value: "black:white:gray50:red:purple:blue:light blue:green:yellow:orange:lavender:brown:goldenrod4:dodger blue:pink:light green:gray10:gray30:gray75:gray90"
[C example ellipted] Color names must be acceptable as identifiers in the [gtkrc][gtk3-Resource-Files] syntax, and color specifications must be in the format accepted by gdk_color_parse(). Deprecated: 3.8: Color scheme support was dropped and is no longer supported. You can still set this property, but it will be ignored. Color scheme support was dropped. This setting is now ignored. Also see the Gtk::Settings::property_gtk_cursor_blink_timeout() setting, which allows more flexible control over cursor blinking. Length of the cursor blink cycle, in milliseconds. The timer is reset after each user interaction. Setting this to zero has the same effect as setting Gtk::Settings::property_gtk_cursor_blink() to false. Name of the cursor theme to use, or nullptr to use the default theme. Also note that the setting can be overridden with the Gtk::HeaderBar::property_decoration_layout() property. Number of pixels the cursor can move before dragging. Maximum distance allowed between two clicks for them to be considered a double click (in pixels). Maximum time allowed between two clicks for them to be considered a double click (in milliseconds). Whether to enable toolkit-wide animations. This value is in milliseconds. 0 disables showing the last char. 600 is a good value for enabling it. Whether to select the contents of an entry when it is focused. Since the error bell is implemented using gdk_window_beep(), the windowing system may offer ways to configure the error bell in many ways, such as flashing the window or similar visual effects. Deprecated: 3.10: This setting is ignored. Gtk::FileChooser uses GIO by default. This setting is ignored. Gtk::FileChooser uses GIO by default. GTK+ uses the family name and size from this string. Timestamp of current fontconfig configuration. E.g. "gtk-menu=16,16:gtk-button=20,20:gtk-dialog=48,48". GTK+ itself use the following named icon sizes: gtk-menu, gtk-button, gtk-small-toolbar, gtk-large-toolbar, gtk-dnd, gtk-dialog. Applications can register their own named icon sizes with gtk_icon_size_register(). Name of icon theme to use. This is the input method that will be used if the user has not explicitly chosen another input method from the IM context menu. This also can be a colon-separated list of input methods, which GTK+ will try in turn until it finds one available on the system. Name of key theme to load. Tab, Shift etc. keys can't be expected to be present on the used input device. Deprecated: 3.10: Generally, the behavior for touchscreen input should be performed dynamically based on gdk_event_get_source_device(). Generally the behavior for touchscreen input should be performed dynamically based on gdk_event_get_source_device(). This is useful when using a screen reader. Whether to select the contents of a selectable label when it is focused. Whether images should be shown in menu items. List of currently active GTK modules. If the value of this setting is true, clicking the primary button in a Gtk::Range trough will move the slider, and hence set the range’s value, to the point that you clicked. If it is false, a primary click will cause the slider/value to move by the range’s page-size towards the point clicked. Available print backends depend on the GTK+ installation, and may include "file", "cups", "lpr" or "papi". The command should contain a f placeholder, which will get replaced by the path to the pdf file. The command may also contain a s placeholder, which will get replaced by the path to a file containing the print settings in the format produced by Gtk::PrintSettings::to_file(). Default value: "evince --unlink-tempfile --preview --print-settings %s %f"
If set to false, the list will always be empty. The number of recently used files that should be displayed by default by Gtk::RecentChooser implementations and by the Gtk::FileChooser. A value of -1 means every recently used file stored. Items older than this setting will be excised from the list. If set to 0, the list will always be empty; if set to -1, no item will be removed. Set to true if the desktop environment is displaying the app menu, false if the app should display it itself. Set to true if the desktop environment is displaying the desktop folder, false if not. Set to true if the desktop environment is displaying the menubar, false if the app should display it itself. Whether the context menus of entries and text views should offer to change the input method. Whether two cursors should be displayed for mixed left-to-right and right-to-left text. Name of theme to load. Expand value for timeouts, when a widget is expanding a new region. Starting value for timeouts, when button is pressed. Repeat value for timeouts, when button is pressed. See Gtk::Settings::property_gtk_tooltip_browse_timeout() for more information about browse mode. Browse mode is enabled when the mouse pointer moves off an object where a tooltip was currently being displayed. If the mouse pointer hits another object before the browse mode timeout expires (see Gtk::Settings::property_gtk_tooltip_browse_mode_timeout()), it will take the amount of milliseconds specified by this setting to popup the tooltip for the new object. Deprecated: 3.4. Generally, the behavior for touchscreen input should be performed dynamically based on gdk_event_get_source_device(). Whether to antialias Xft fonts; 0=no, 1=yes, -1=default. Resolution for Xft, in 1024 * dots/inch. -1 to use default value. Whether to hint Xft fonts; 0=no, 1=yes, -1=default. What degree of hinting to use; hintnone, hintslight, hintmedium, or hintfull. Type of subpixel antialiasing; none, rgb, bgr, vrgb, vbgr. 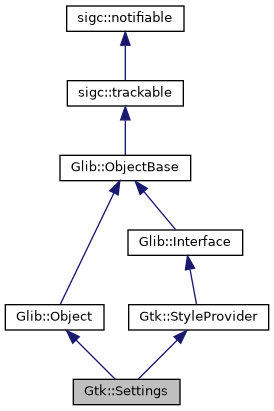 Undoes the effect of calling Glib::object_set() to install an application-specific value for a setting. After this call, the setting will again follow the session-wide value for this setting. name The name of the setting to reset.